Are you ready to change position? Every detail adds strength to the character of the new Ducati XDiavel. Premium quality materials and refined finishing blend with top-level technology in the S version to bring the most unique and unmatched design to life. 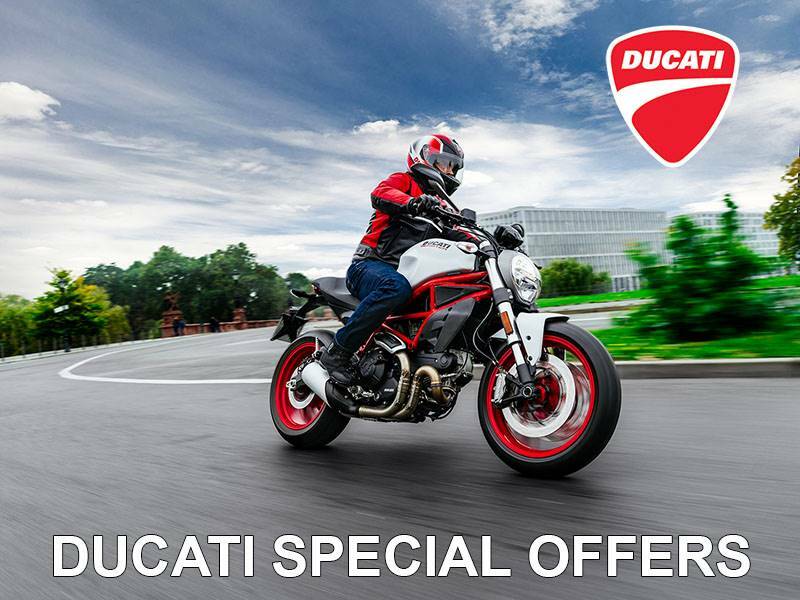 Guarded at the heart of the motorcycle, the new Ducati Testastretta DVT 1262 engine is the undeniable centrepiece. Shiny and black with machined details in full view, ready to deliver terrific torque throughout the rev range. MAXIMUM 40° LEAN: The XDiavel can guarantee, thanks to a maximum 40° lean angle, dynamic performance and emotions worthy of a true Ducati, but only when you want to push it to the limit. The frame, suspension, brakes and ride parameters have been designed to offer as much fun as possible, without compromising on comfort and ease of riding, essential when riding at a relaxed low speed. TRELLIS FRAME: Elegant in its proportions, the XDiavel has been deliberately designed "element by element". One of these is the frame which is immediately recognizable as the classic Ducati trellis frame. 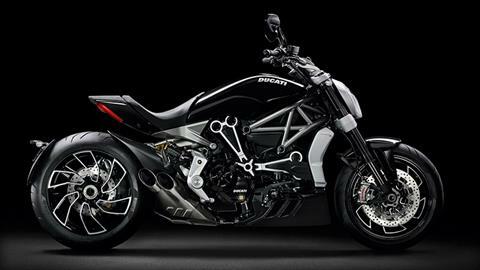 The frame of the XDiavel is a steel tube frame which integrates the Ducati Testastretta DVT 1262 as a stressed element of the chassis. The frame is attached to the engine at the level of the two cylinders heads, as is the rear subframe in shell casting aluminum alloy. FORWARD FOOTPEGS: When the designers and engineers started to work on the XDiavel, they started from a basic concept: a relaxed riding position, like a real cruiser, with a low seat and forward footpegs. But that was not all: the ergonomics had to be modular, so as to allow the rider to meld into the bike, like a tailored suit. That is why the footpegs of the XDiavel can be adjusted as standard in three positions (+/- 22.5 mm compared to the standard position). In addition, for anyone favoring a more sports riding position, a Ducati Performance "central footpegs" kit will be available, sold as an optional extra. ADJUSTABLE SUSPENSION: The XDiavel has a 50 mm diameter front fork with black anodized sheaths, which can be completely adjusted in the hydraulic braking in compression and extension and in the spring preload (the S version also has stems with DLC coating). The fork has the compression register and spring preload on the left stem, while the extension register is located on the right stem. With a steering inclination of 30° and a 130 mm trail, the set-up of the XDiavel enables an agile and controllable front end, thus guaranteeing exceptional handling and a notable steering angle. On the other hand, at the rear the XDiavel has an adjustable mono-shock in the spring preload and in extension, equipped with a separate fuel tank. Mounted almost horizontally, the shock absorber works together with progressive kinematics. STEEL FUEL TANK: The steel tank is strongly reminiscent of the cruiser world but also incorporates all the DNA of the Monster and Diavel. In the XDiavel it has a Dark Stealth color, while in the S version it is painted in Thrilling Black with a matt black band and red thread to maximize the values of elegance and sportiness. 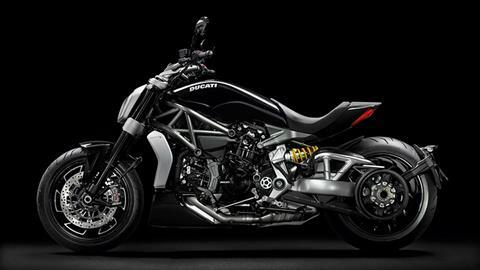 BOSCH BREMBO BRAKING SYSTEM: The XDiavel is equipped, as standard, with the Brembo braking system with Bosch 9.1ME ABS Cornering as an integral part of the Ducati Safety Pack (DSP). ABS Cornering makes use of the IMU (Inertial Measurement Unit) platform by Bosch to optimize the braking power of the front and back wheels, also in critical situations and when cornering. The system, implemented within the Riding Mode, can provide performance to suit all conditions and riding styles. 90 ERGONOMIC CONFIGURATIONS: 90 as the number of different possible ergonomic configurations for the rider, by combining the various options available as standard or as an accessory. The XDiavel can be customized like a tailored suit thanks to: 6 footpeg positions - front set (standard), front set + 22.5 mm (standard), front set - 22.5 mm (standard), rear set -40 mm (accessory), rear set -63 mm (accessory), centered (accessory). 5 seats - standard (standard), comfort, wide (accessory), high + 20 mm (accessory), super high +50 mm (accessory), low - 10 mm (accessory). 3 handlebars - standard (standard), front set + 25 mm (accessory), rear set - 25 mm (accessory). Moreover, for the passenger the XDiavel standard outfit includes a comfort kit, with passenger comfort seat and backrest. TUBULAR/MOULDED SINGLE ARM FRONT FORK: The single-sided swing-arm is a masterpiece of engineering and design. The lower part of the swing-arm is molded, while the upper part is in a tubular trellis frame with a forged and removable section which enables the transmission belt to be removed. The swing-arm on the S version is enhanced with a specific surface treatment: naturally anodized and brushed. LONG MAINTENANCE INTERVALS: The constant investment in quality guaranteed by the design, advanced materials and engineering has made it possible to modify the maintenance schedule in a very competitive way, bringing routine maintenance intervals to 15,000 km or one year and valve regulation to 30,000 km, to the great benefit of customers. This is made possible thanks to the use of particular materials for the valve housings, an improvement in the efficiency of the fuel combustion and by limiting the operating temperatures of the Testastretta DVT engine. In addition, the innovative DVT system does not complicate the valve regulation work. 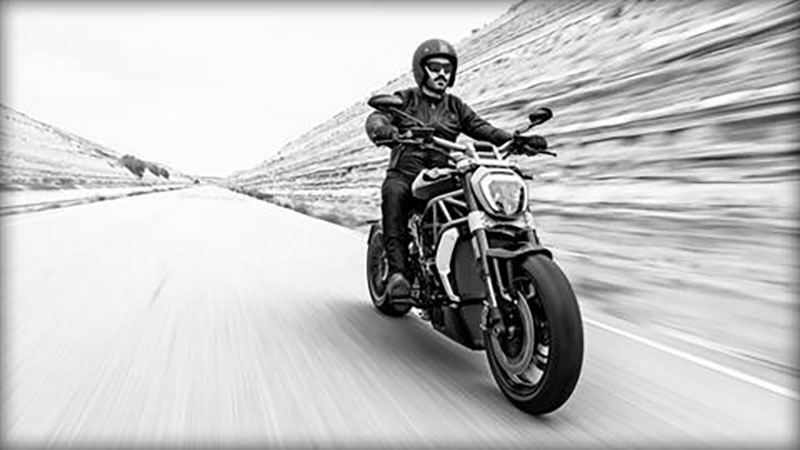 TORQUE AND POWER: At 5000 rpm the twin-cylinder engine of the XDiavel reaches maximum torque, equal to 12.8 kgm. An extremely low regime for a Borgo Panigale bike but perfect for cruising. In addition, already from 2100 rpm, the XDiavel engine guarantees torque of over 10 kgm with an extremely flat curve up to the limiter. The engine, however, remains a real Ducati engine with a maximum power of 152 hp and exciting performance at all running speeds. 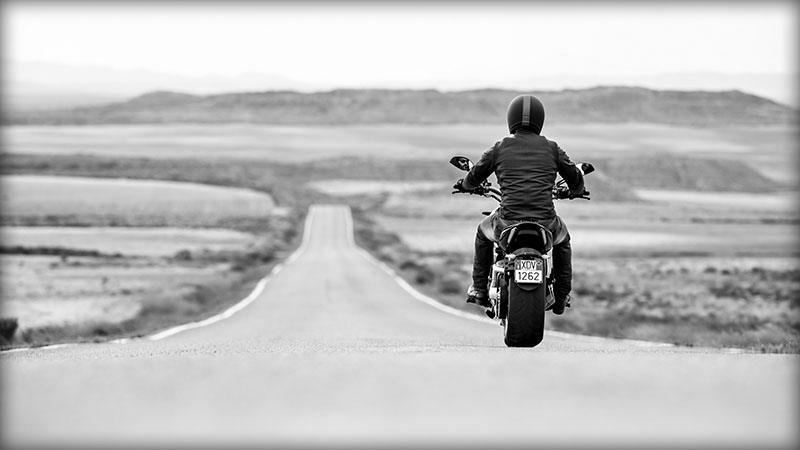 RIDE-BY-WIRE: The Ride-by-Wire (RbW) system is an electronic interface between the engine and the Diavel's fuel grip, which allows the ideal power level to be configured depending on the Riding Mode selected. The power supplied by the engine is no longer regulated solely and directly by the accelerator cable, but passes through the control unit which, on the basis of the signal received, electronically regulation the opening of the throttle. The RbW system uses three different mappings to regulate the supply of power: 152 hp in Sport Riding Mode, 152 hp in Touring Riding Mode, 100 hp in Urban Riding Mode. 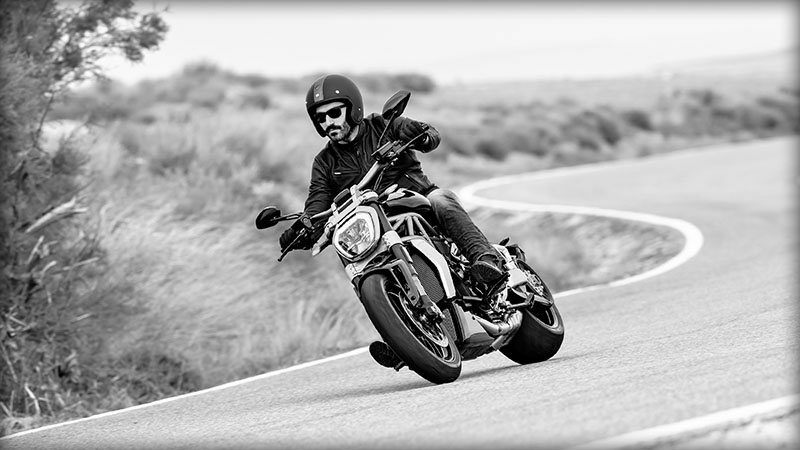 BOSCH ABS CORNERING: The XDiavel is equipped with the most recent and compact ABS Bosch system, which makes an essential contribution to controlling performance. The high quality Brembo components combined with Bosch ABS, the specific suspension set-up and Pirelli Enhanced Patch Technology guarantee excellent braking performance for the XDiavel as well as utmost safety in all conditions and for riders of any level. The system can act in a more or less sensitive way and the intervention level can be chosen by the rider based on their experience and road and/or use conditions. There are three ABS profiles available (Expert, Sport and Safe & Stable) and they are preset as standard in each of the three Riding Modes, but can be called up individually by accessing a user-friendly menu. ELECTRONIC COMPONENTS: The Ducati XDiavel uses Bosch Inertial Measurement Unit technology which, by dynamically measuring the angles of roll, yaw and pitch as well as the speed of the related changes in set-up, allows performance and safety standards to be increased. The IMU enables the Riding Modes (Sport, Touring and Urban) to provide three distinct spirits to the bike. Every Riding Mode has different settings for engine supply, maximum power, Ducati Traction Control and ABS Cornering. In addition, each electronic control system can be modified separately in terms of its intervention and, thanks to the Default function, it is possible to reset all, or some, of the values to the standard setting. HANDS-FREE START-UP: Turning on the XDiavel is governed by an electronic key which can be carried in your pocket. The key communicates with the bike up to a distance of around 2 meters. The bike recognizes the specific key and automatically turns on the commands. At this point it is possible to press the key-on button to turn on the control board and start the engine. The electronic key consists of an electronic circuit and a mechanical "flip" key needed to open the seat and fuel tank cap. An electric actuator is also included for the steering lock. 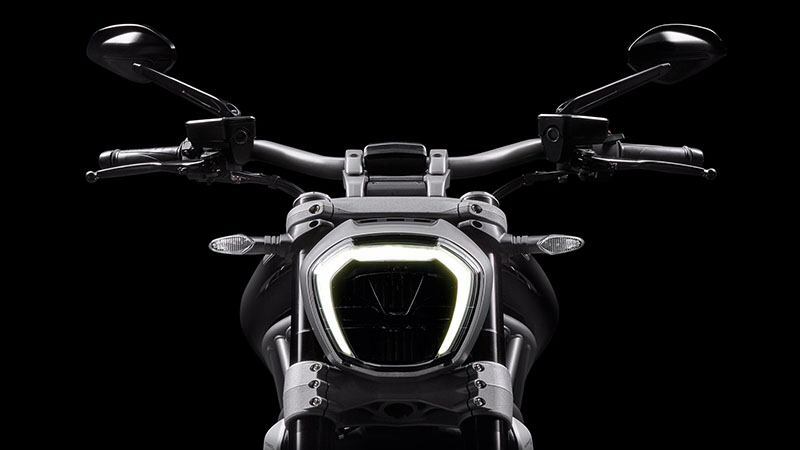 FULL LED LIGHTING SYSTEM WITH DRL: The XDiavel S features a dominant front headlight with Daytime Running Light (in countries where it is allowed). The DRL is a particular light which guarantees perfect visibility of the bike during the day and, at the same time, thanks to its particular form, makes the XDiavel S instantly recognizable also in sunlight. 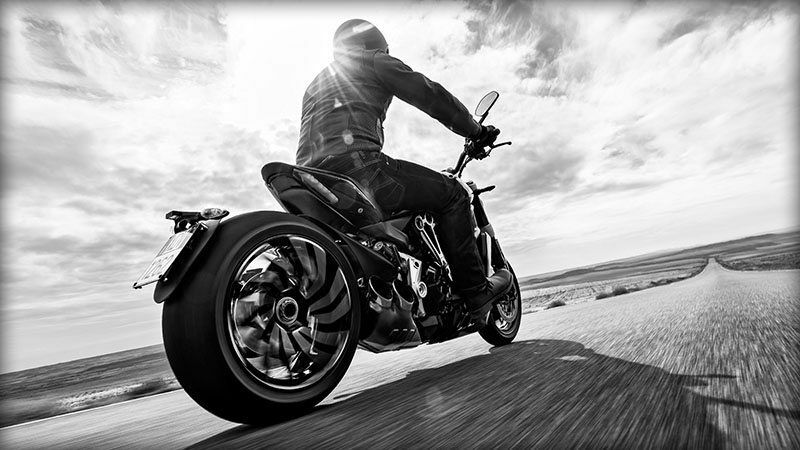 TIRES AND WHEELS: The XDiavel has 14-spoke wheels. At the front the wheel is 3.5 x 17 in., while at the back it is 8 x 17 in. 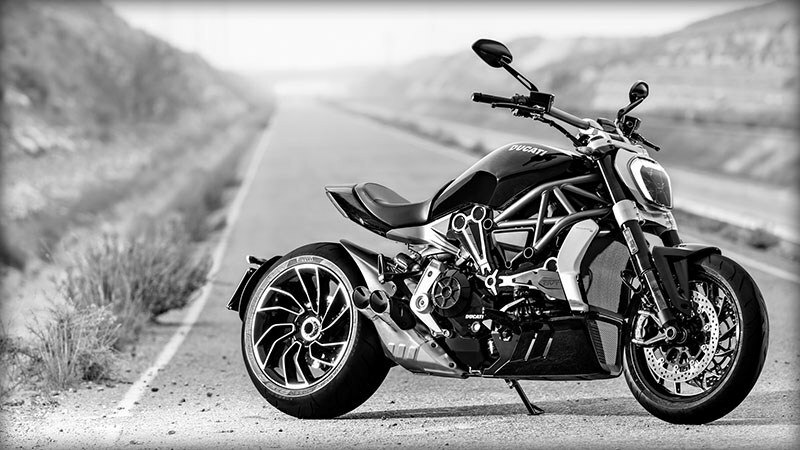 XDiavel S, on the other hand, has exclusive curved 12-spoke wheels with visible finishings which highlight the design. On the front wheel is a traditional 120/70 ZR17 tire with a redesigned tread to maximize performance in the wet, while the rear wheel is 240/45 ZR17. The covers are Pirelli Diablo Rosso II. The large rear tire uses double compound technology to increase grip during the most extreme cornering, guaranteeing at the same time high kilometric performance and applying Enhanced Patch Technology to maximize the contact area with any lean angle. The tread design and the compounds used guarantee exceptional performance in all conditions, especially in the wet. S VERSION: The S version is equipped as standard with a DRL (Daytime Running Light) system for the front light, DLC for the stems of the front fork and Brembo M50 monoblock calipers for the front brake. The exclusivity of the XDiavel S is enhanced by visible mechanical finishings: the belt covers of the engine, the frame plates, the footpeg plates, and the wheels with their unique and exclusive design. Finally, to complete the S version, the rear-view mirrors are machined as a single piece, the seat has bi-material covering, the natural anodized and brushed fork and the Bluetooth module for the infotainment system. 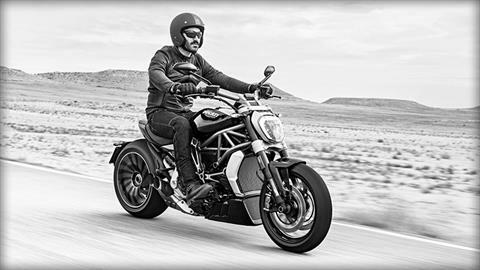 RIDING MODE: The XDiavel integrates the latest innovations in Ducati technology, such as Riding Modes. The three preset modes, which can be selected during riding, are programmed to instantly modify the "character" of the XDiavel. The three Riding Modes work by combining different cutting-edge technologies, such as Ride-by-Wire (RbW), Ducati Traction Control (DTC) and ABS Cornering Bosch systems. Riding in town means moving attention from control of the accelerator to the surrounding environment: the Urban mode, therefore, instantly changes the character of the XDiavel, transforming it into an easy to handle form of transport which feels safe. The power supplied is reduced to 100 hp, the DTC is set at level 6 and the ABS profile is set to Safe & Stable, in order to always move in complete safety, even on uneven surfaces and in heavier traffic. The Touring Riding Mode enables the engine to supply all its 152 hp but with a soft and easy to handle power curve. The DTC is set to level 4 and the ABS on Safe & Stable, for pleasant and relaxed riding, ideal for maximum comfort for the rider and passenger on long journeys. The Sport Riding Mode offers pure fun, with the engine releasing 152 hp through a precise, expert touch of the accelerator. To experience the performance of the XDiavel without any compromise, Sport Mode reduces the DTC to level 2 and sets the ABS to Sport mode. BLUETOOTH CONNECTION: The XDiavel S comes with a Bluetooth module for the infotainment system which, by connecting a smartphone to the dashboard, can show incoming calls and text messages and show what music you are listening to. DASHBOARD: The dashboard of the XDiavel consists of a TFT screen with a separate warning light panel, positioned above the handlebar. The dashboard has four different viewing modes. The Default mode shows the minimum essential information with a very polished design, a brand new look for a Ducati dashboard. The other three modes are the classic viewing modes of Track, Full and City, connected to the three Riding Modes. The XDiavel has electric locks which are backlit in red. When stationery, a "settings" menu can be accessed via the left-hand lock on the handlebar on which the various functions, including DTC, DPL and ABS Cornering, can be activated and managed. In addition, the Cruise Control has dedicated buttons to switch on and manage the set speed. Whether stationery or on the move, you can change the Riding Mode, choosing between Sport, Touring and Urban.